After losing the first ODI of the three-match series in Sydney, the Indian team is in a desperate need of a win in the second DI against Australia in Adelaide. However, the Indian skipper Virat Kohli once again lost the toss and the Australian skipper Aaron Finch decided to bat first. The Indian bowlers made early inroads, but they were asked to chase down a stiff target of 299 in their quota of 50 overs. However, the chase was completed by the two best chasers of India Virat Kohli and MS Dhoni as they scored a century and a half-century respectively. 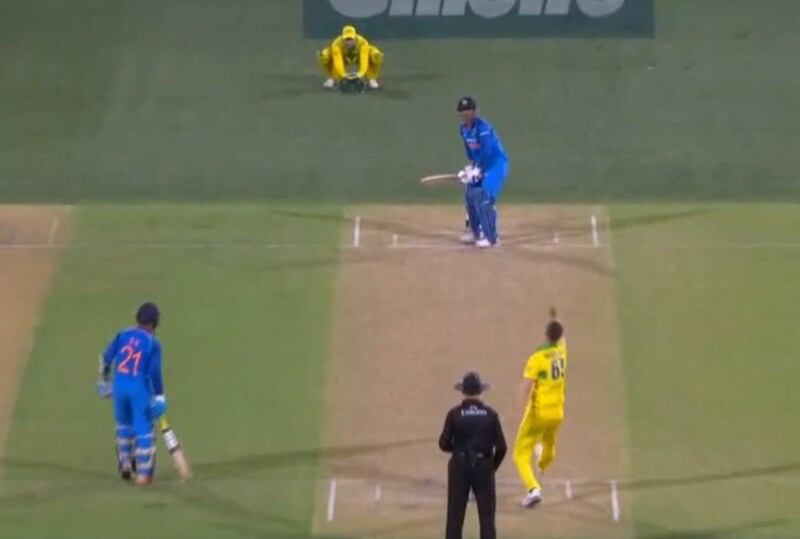 It was classic Kohli chase in Adelaide which ended with a six from Dhoni in the final over and his fans witnessed some nostalgia. While chasing the target, India needed just 7 runs off the final over with Dhoni at the strikers’ end along with Dinesh Karthik at the other end. Jason Benhrendrff was bowling the final over of the match, but he made a mistake on the very first ball of the over by bowling a length on off stump to MS. The latter made the most use of it to smack it over wide long-on for a six and also completed his half-century. there have been a plethora of occasions when Dhoni has smashed this ball – 49.1 – for six in his ODI career. India needed just one run off the last five balls and Dhoni took to make India go over the line. The ball was full, close to off stump, and he clipped it just wide of mid-on and hurries through to the other end. 2018 wasn’t a great year for Dhoni, but he’s begun 2019 with two fifties in a row, the second one a vintage Dhoni chasing innings. 💙 Calmly heads back to the dressing room. 😇 Only MS Dhoni things!